I didn’t know a replica of this building existed until Scott brought his over to display during the SBCS convention in D.C. Construction on the Washington D.C. Convention center began in 1980. Opened in 1983, the 800,000-square-foot was the fourth largest convention facility in the United States at the time. 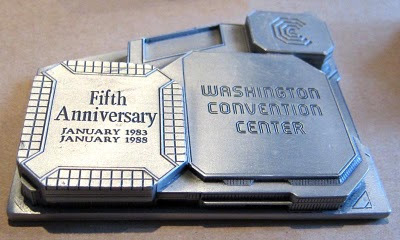 However, during the 1980s and 1990s, numerous larger and more modern facilities were constructed around the country, and by 1997 the Washington Convention Center had dropped to the 30th largest facility and became too small to compete for a vast majority of national conventions and meetings. 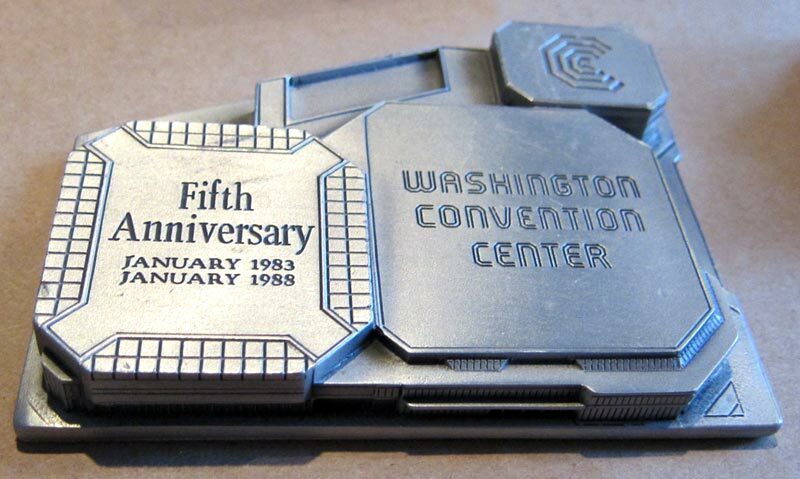 It only stood for 22 years and D.C.'s old Washington Convention Center was demolished on December 18, 2004. You can see a video of the implosion here. The block where the building stood was then used as a parking lot for many years. A pewter miniature souvenir replica of the building was produced in 1988 for the fifth anniversary of the structure. The 10-acre old Convention Center site in Downtown Washington, DC is now in the process of being redeveloped. The $850 million mixed-use project is expected to include retail, housing, and office space with an upscale, 400-room hotel and 100,000 square feet of additional retail space. Just two blocks away, the new Washington Convention Center was built in 2005 and I wrote about a souvenir of that building a while back.